Earlier this year the FCC, led by FCC Chairman Ajit Pai, voted to repeal net neutrality by a 3-2 vote along party lines. The "Restoring Internet Freedom Order" takes effect on June 11th, and that will allow ISPs and wireless carriers to offer "fast lanes" for content providers who are willing to pay extra for their streams to travel faster, or with a higher resolution. The Obama-era regulation requires that all content be treated the same by internet and wireless providers. If net neutrality is repealed, carriers could throttle or block content that they don't like. Supporters of net neutrality in Washington D.C. have already hiked the ball on a Hail Mary play. The Congressional Rule Act (CRA) allows the FCC's repeal to be overturned by a majority vote in the Senate and the House, and the actual order must be signed by the president. While the 49 Democrats in the Senate were able to get three Republicans to cross the aisle, things are going to be harder in the House where Republicans have a 235-193 advantage. 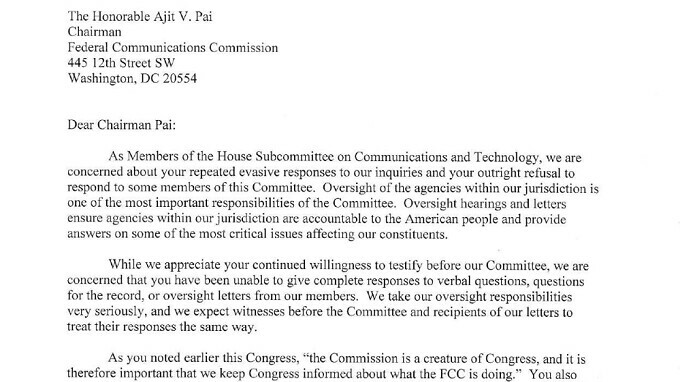 Today, 13 House members belonging to the Committee on Energy and Commerce wrote a letter to FCC Chairman Pai, accusing him of evading their questions and his "outright refusal to respond to some of the members of this Committee." Lawmakers supporting Pai and the repeal of net neutrality might feel confident that the regulation will be 86'd on June 11th. After all, even if it gets past the House by some miracle, what are the odds that the president signs a CRA order that overturns the FCC's repeal? Or that such a veto gets reversed in the House and Senate? Democrats hoping for a 'U.S. beats the Russians in Olympic Hockey' sort of upset in the House, are turning net neutrality into a campaign issue for the U.S. mid-term elections. Those Representatives up for re-election who vote against the CRA order are going to be hammered again and again by their opponents, who sense that the majority of Americans want net neutrality to live. The complete letter written by the 13 House members to FCC Chairman Pai can be viewed by clicking on the sourcelink. He should have won. I was in with the net neutrality thing. Trump administration is the worst ever!! This is what we deserve for letting a snake like trump become president. You can stop giving those greedy ISPs your money if you don’t like their offerings. Right, we’re just too dependent on internet, we can’t.